Preheat oven to 400°F. Press pie crust rounds into a muffin tin. Bake in preheated oven for 12-15 minutes, or until golden brown. Remove from oven and cool. Set aside. In a large bowl, combine blood orange juice, freshly squeezed blood orange juice, 1/2 cup of sugar, cornstarch, and 1 egg and two of the yolks in a microwave-safe bowl. Microwave in 45-second bursts, whisking between each set, until the filling has set up. Remove pie crusts and place on a parchment-lined baking sheet. Spoon thickened filling into the center of each crust. In a stand mixer, beat the two remaining egg whites together until stiff peaks form. Add Cream of Tartar and remaining 1/4-cup of sugar. Whip just until a silky meringue forms. Spoon meringue atop each blood orange pie. Place in preheated oven and bake 8-12 minutes, or until the meringue is golden brown and cooked through. Remove and cool before serving. Wanna be gorgeous? Eat gorgeous! Or, at least that's what my mama always said. 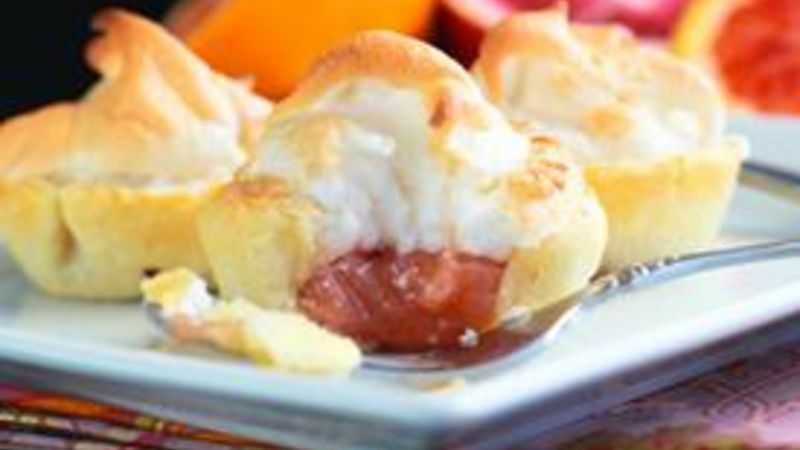 At any rate, it's worth a try with these beautiful Blood Orange Mini Meringue Pies and six other blood orange recipes! Open up, pretty baby. It's gonna be a delicious day! This fun, little recipe starts with a simple lineup of ingredients. Even though there are several steps, they're supremely easy, with the filling actually cooking in the microwave, and the crust and meringue getting all toasty and warm in the oven. You mean, a beautiful recipe with both substance AND style? Oh, yes. It's like a feminist supermodel. Just all sorts of feisty goodness a happenin' in tiny, little pies. Start by pressing rounds of Pillsbury pie crust into a muffin tin. Bake until golden brown. Spoon the blood orange filling into each pie cup, then top with fluffy, silken meringue. And no fussing about wearing white before labor day, the pie doesn't care. She's just all about looking good. Sometimes food gets vain like that. Gently transfer each itty bitty delight to a parchment-lined baking sheet and bake in a preheated oven until the meringue sets, cooks through, and looks as perky as a summer day. All fashion references to the former sentence hereby withheld for propriety's sake. With couth in tact, and a pan full of pies waiting behind the scenes, it's time to prep the runway. Grrr. Rowr. Meow. Blood Orange doesn't get more gorgeous than this. Looking for a few other ways to bake up Blood Oranges in zesty, schmesty, super beautiful ways? Dig into a few of our fave recipes and let your world be just a little tastier than it was yesterday! Jump into a bit of feisty fun with these Blood Orange Mimosa Pies. Utterly refreshing, sweet, and splendid, what better way to start your day than with a Mimosa... in a pie?! Turn your blood oranges into something you can lick off a stick! Check out these gorgeous Blood Orange Pops from White on Rice Couple. Take traditional popsicles and turn them gourmet! Simple, colorful, positively perfect! Add blood orange slices to a pitcher of homemade Sangria, and you'll be the talk of the town! Or at least the talk of the partay. Because, honey, when you bring the Blood Orange Sangria from How Sweet Eats... you IS the partay! Mix up this simple and splendid Blood Orange Sherbet (which is hello gorgeous!) from Cafe Johnsonia and make a refreshing sherbet which is just light enough to end any dinner without that usual overly-decadent feeling you get from most desserts. Leetle, cutesy one-bite Blood Orange Tassies may be the most adorable thing you've made in your kitchen all year. They'll very likely be the cutest thing you've put in your mouth all millenium. What happens when you add a little tequila to the bright red goodness of a blood orange? Why, this twist on happy little margaritas. We call them Bloody Margaritas, but you can call them pretty darn delicious! Brooke blogs Cheeky Kitchen where she shares fun family recipes. She joined Tablespoon to share some of her best, so keep an eye on Brooke's profile to see what she cooks up next!